Bankya is a small picturesque town, is just 10 km west of Sofia. Although the town is in close proximity to the capital of Bulgaria- Sofia, there is no sign of the noise and vanity of the big city. Situated at the foot of Lulin Mountain, among raving flora and washed by the sun beams, Bankya is a site, where tourists will be able to enjoy a great holiday. Bankya is a famous spa and a national centre for rehabilitation and prophylactics of heart- vessel diseases. 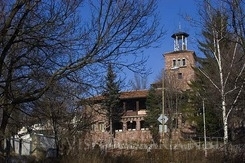 Bankya is formed as a prestigious national and international resort and ecologic reserve of Sofia. There are numerous cosy hotels, mehanas and restaurants in Bankya, where visitors will feel the warmth of the local hospitality. Just a walk in the town’s park can refresh everyone. Visitors can pour hot mineral water with proved healing quality from the local springs. - The international festival of the child song “Million miracles” – takes place each year since 2001. It takes three days and is usually between 16- 18 July in “Water world” complex. Children from Romania, Serbiya, Montenegro, Macedonia, Georgia and other countries perform at the event. - Each year the town hosts traditional celebration honoring the mineral water and long life “Goreshlyatsi”. The water is known that the quality of water is best during the hottest days of the year 15, 16 and 17th July. They are accepted as a town holiday. You can reach Bankya through 2 main roads – the junction of Milyonovo hanche on the way to Serbia and the road next to the Philipovtsi neignbourhood. The town is part of the national railway net. 5 km away from Bankya is the road to Klisura monastery “st. Petka”. 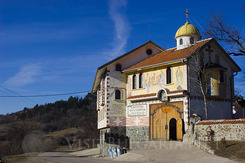 The monastery is extremely beautiful and fascinates visitors with its unique wall paintings. You can book hotel accommodation in Bankya, by simply browsing the left menu with offers. Just choose a hotel that best suits your needs, or ask our representative for offers in Bankya.